Introducing the latest and greatest fashion accessory for Spring as modeled by our very own Little Miss Emma. As you can see, this wonderful hat, though appearing to be a fur fit for Winter, is lightweight and has quickly become the new “must have” of the Spring Season. 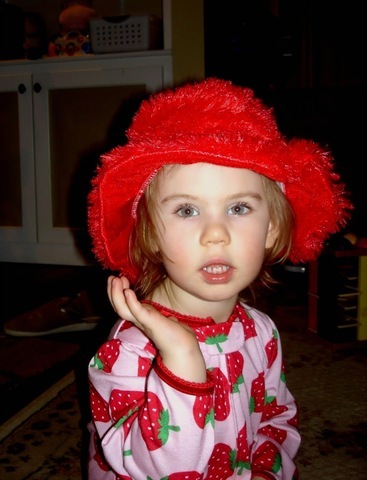 Emma highly recommends wearing the hat with this Spring’s lineup of strawberry covered pajamas. This one’s mine…go get your own! It’s just all the rage, don’t you think? OOOH! OOOH! Where can I get one…no TWO….one for me and one for Sam! Frankie stole most of my jammers and Laura got the rest (They\’re always "shoping" in my closet and dresser!) I still have my bib overalls and "Eat More Possum" T-shirt. With that hat to complete the ensemble I would be the talk of the barber shop….."Got yer meds mixed up again, Chip? "She\’s a doll and looks simply divine! Very sheak miss Emma. Definitely a trend setter. Oh what a fashion plate she is. Such high recommendations. Such a lovely model. I think Emma is the cat\’s meoow. The hat is stunning and the model is beautiful. 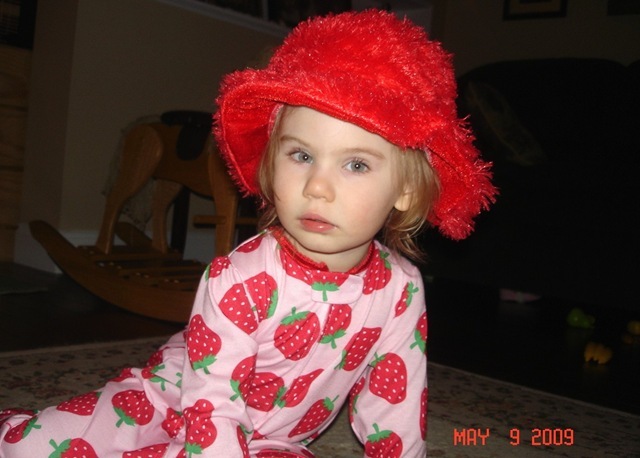 If I could pull off wearing the strawberry pajamas, I\’d definitely get the hat to go with the outfit. Emma looks fabulous! She is so so cute. Loved this Blog . Hug to the Sweetest Little one . Emma looks so, so cute in her furry hat, and love the P.J.s too … very trendy missy you are . Amazing… This little girl is so special. Very nice photos of Emma, the hat suits her also.